Kristy was in one of Jensen's Limo's heading to the place Jensen was staying. As She sat she thought about her last match. The funny thing is, She thought, I was up all night that one night watching video's of Brooke's matches and I didn't even get to face her. Kristy was disappointed about that, She for some reason was put up against Ciaran Michaels. Even through she had been training to beat Brooke she still managed to beat Ciaran. So she was glad about that. The limo started slowing down as it reached the gate of a huge manor. The driver spoke to the guard at the gate through a screen thing that was mounted on the gate. After a second or two the gate then opened and the limo continued to move forward. The driveway was one of those circle driveways and so the limo driver pulled up to the front of the manor. Kristy could see that some kind of butler was standing right at the foot of the steps that lead into the manor. The butler guy opened the door of the limo and gestured for Kristy to come out. Kristy got out and the butler guy shut the door as the Limo pulled off. "Mr. Jensen is expecting you, " the butler said politely, "Please follow me." Kristy followed the butler into the manor and into a room. The room was rather large with two pool tables in the center of it. On one side of the wall were the racks for the pool sticks and a couple of shelves for various other pool accessories. Jensen was currently standing by one of the pool tables, Shooting what looked like the last ball on the table into the corner pocket. "Ms. Tiger is here sir," the butler announced. Jensen turned around. "Thank you, Darwin," Jensen said. Darwin left the room. Jensen then pointed to the other pool sticks and Said, "Grab a stick." So Kristy went to grab one as Jensen started racking up the balls. Kristy walked over to the other side of the pool table that Jensen was on. After Jensen was finished putting the balls into place he rolled Kristy the cue ball. "You can break," He said. Kristy took aim at the group of balls at the other end. "So," Jensen said casually, "See you made it past the first round." Kristy hit the cue ball and made the break, She managed to sink one of the stripes. "Yeah, " She said as she looked for another shot, "But it wasn't against who I was suppose to." Kristy took aim and shot, missing the pocket she was aiming for. "Who you went up against is not important, " Jensen said as he scan the pool table for a shot, "What is important is that you won your match and now your heading into the second round." Jensen found his shot and perfectly laid the ball into the pocket. "Well, now I'm up against Sean Lewis," Kristy said, "And I've heard he has quite an impressive record." Jensen made another shot, sinking the ball again, before speaking, "You shouldn't let that bother you, " Jensen said, "It is true that he has a record, but how do you think he got that record. " Jensen paused for a second to sink another ball, "He got that record by beating others who had records. No ones undefeatable." Kristy thought about that. Jensen was right Kristy thought. In order to get a record, you have to beat others who had records. 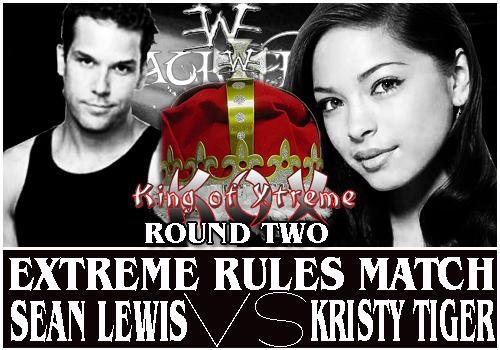 Kristy also knew that she'd have to beat Sean in order to stay in the tournament. She remembered the Sean had been at eWe for a long time, longer than her and even Blitz. She even thought that he had been eWe champion at one point. But Kristy wasn't going to let that hold her back. Sean has had is time to shine, and now it's her turn. Just then Jensen spoke interrupting her thoughts. "Eight ball corner pocket," Jensen said. Kristy looked at the table in bewilderment. All the stripes were still on the table, all except the one she knocked in at the beginning of the game. Jensen had some how managed to knock in all of his without a single miss. Jensen then Shot in the eight ball which went in perfectly. "I win, " Jensen said half smiling. "How'd you do that?" Kristy asked. "Years of practice," Jensen said. Jensen began to rack the balls again. "Do you still want to play?" Jensen asked a little cocky. "I guess so, " Kristy said, "But I get to break this time." The two continued to play pool. Jensen managed to win every time, but he did go easier on her. After they played for about an hour a butler came into the room. "Dinner is ready, " The butler announced. Jensen turned to Kristy, "Shall we?" Kristy responded by putting down her pool stick and Jensen did the same. The two then followed the butler to the dinning hall. The dinning hall was beautifully decorated, and it had a long table in the center of it. Jensen and Kristy walked up to the table. Jensen then pulled out Kristy chair, the one right by the head of the table. "Why thank you, " Kristy said with a smile. "My pleasure, " Jensen returned. He then sat at the head of the table. The butlers then served both of them a plate each. They had a delicious six course meal. Once they were done Jensen walked Kristy to the front door. "Well, it was nice of you to have come," Jensen said. "Always a pleasure, " Kristy said. They reached the front door Jensen stopped in front of it. "I have a surprise for you." Jensen said. "Really? " Kristy asked, "What is it?" "Well, I know that you don't have a reliable transportation to get you around, So..." Jensen opened the door. Parked outside was a blue mustang. Kristy eyes went wide, "you got me a car?" Kristy walked to the car and examined it. The car was tricked out in all kinds of cool features. She then opened the driver's side door and got in behind the steering wheel. She placed her hands on the wheel feeling it's texture and design. Jensen then walked up to the open driver's side door. "Like it? " Kristy got out of the car and gave Jensen a hug, "I love it!" Kristy pulled her head back and looked at Jensen. They looked into each others eyes and Kristy could feel the tension. Kristy pulled away. "Well um, "Jensen began as he pulled out a blue card, "Just show this to the guys at the airport, when your heading to the next Heatwave place, and they will see to it that you get your car when you land at your destination." Kristy took the card and looked at it, but she was still thinking about what had just happened. Then Jensen Pulled out a set of keys. "These are the keys to the car, " Jensen pointed out, Kristy could here it in his voice that he still hadn't fully shaken the moment either. Jensen reached out to give Kristy the keys then he released them to soon as Kristy made an attempt to accept them. "I got it, " Kristy said as she started crouch down and get them. But immediately Jensen said, "No I got them," and he crouched down too. other again. Both of them could feel the tension they had felt earlier rise again. But this time Both of them slowly leaned their heads in together. They got to where their foreheads we're touching each other. They paused like that for a second then they kissed. They held the kiss for a few seconds then they broke. and stood back up. "Uh... I guess I'll see you later," Jensen said almost silently and handed her the keys. "Y-Yeah, I guess so," Kristy said in the same tone. Kristy got into her new car and drove off. Kristy drove in silence. The effects of what just happened still fresh in her mind. She had kissed him. Michael Jensen, owner of the eWe. She wondered what will happen next. Will Jensen act like it had never happened Or will he take their relationship to the next level? Did she really want to take their relationship to the next level? Kristy thought about that. Jensen was pretty handsome, despite his bald head. But Kristy just thought that his lack of hair just sort of defined him. It'd be weird to see him without it. Jensen was also rich. But then again he was the owner of eWe, well Co-Owner to be exact. But She didn't want the other wrestlers to think that Jensen was giving her some kind of unfair advantage. She continued to think about the pros and cons of dating Jensen, when her phone rang. "Hello," Kristy said answering the phone. "Yes, Kristy, This is Kenny Greenwood, " Said the guy on the other end of the phone, "You called me earlier on in the week to schedule an interview." "Yeah I did, " Kristy replied, "So when is it?" "How about in the next thirty minutes, " Kenny said. "Sure, I'm heading over there right now," Kristy said. "Ok then, " and with that he hung up the phone. Kristy hung up hers too and drove over to the arena for the next Black Friday match. "Hello this is Kenny Greenwood, " Kenny said in front of a cameraman holding a camera, "I'm here interviewing Kristy Tiger." "Ok, Kristy first question, " Kenny said turning to Kristy, "How did you feel about the event that took place during your match last Heatwave?" "Well, I'll admit I was a little disappointed. I was studying Brooke's movements and tactics, only to find out that I was had to face someone else." "Yes that can be disappointing, " Kenny said, "But you did manage to beat Ciaran Michaels, who was the guy you had to face." "Of course," Kristy said, "I was surprised when they had said that I'd be facing Ciaran instead of Brooke but I set that feeling aside and focused my attention on Ciaran." "And now your in round 2 of the King of Extreme tournament going up against Sean Lewis, " Kenny said, "Any comments?" "Yeah, " Kristy replied, "I'm going out there to win. He may have beaten many others, but lets face it, he's never faced me before. When we enter that ring, we will be on equal playing field, All past records will be left behind." "Strong words, " Kenny said, "Do you think you have what it takes to become the next King of Extreme?" "I'll admit, I'm not sure, " Kristy said, "but what I do know is that I'm going to take each round one at a time. There are great wrestlers in this tournament, but even great wrestlers loose sometimes. This could very well be that time." Kenny turned his head towards the camera and said, "Well that's all we have time for. This is Kenny Greenwood, and Kristy Tiger. Until next time." The man holding the camera turned it off. Kenny turned to Kristy and said, "Good luck with your match." "Thanks," Kristy said and walked off.